DC’s future movie line up is looking pretty great. Suicide Squad, Wonder Woman and Justice League are up next. Heroic Hollywood, dropped a few scoops on some of DC’s more distant films like Shazam and a character breakdown for The Flash. While we haven’t heard anything about Cyborg, if you’re interested the other DC Film due out in 2020 we may have some exciting news for you. 2020’s Green Lantern Corps is still very far away and we haven’t yet received a casting. A WB Executive recently stated that none of the Green Lanterms would arrive until the solo film in 2020 and that’s looking more and more likely. No one is currently in contention for any GL, but they are in the process of casting him. Previously rumored for the role of Hal Jordan, Chris Pine declined thst there were ever any talks. He was ultimately cast as Steve Trevor in the solo Wonder Woman film. 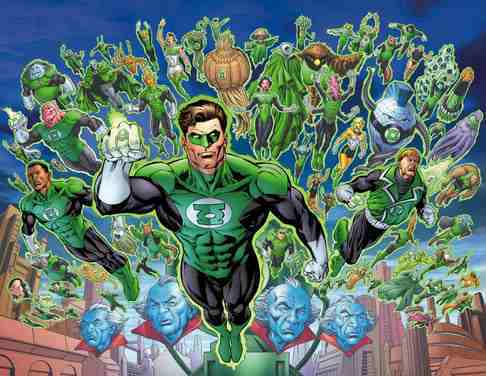 Latino Review is reporting that in addition to Hal Jordan and John Stewart one more Green Lantern will be added to the team. Kyle Rayner is the latest Green Lantern that will be enlisted into the Green Lantern Corps when it hits theaters in 2020. They also report that the studio is actively looking to cast an older actor around Matt Damon’s age for Hal. Justice League has already started filming and if they plan on including Green Lantern in some shape or form, they need to have him cast very soon. What do you guys think about Kyle Rayner teaming up with Hal Jordan and John Stewart? Are you a little let down that they’re leaving out Guy Gardner? Sound off in the comments section. The next installment to the DC Extended Universe, Suicide Squad hits theaters August 5th, 2016 and Green Lantern Corps hits theaters June 19th, 2020! I’m good with this. I’m really shocked that they are not looking for someone to play Guy Gardner. They may yet. I’m sure WB has the 3 movie plan. Kyle is half-Latino. Political correctness demands that Guy Gardner remains in the funny pages. LOL, yeah, Kyle is half Mexican. There’s alot of diversity in the ranks of the Corps. Not if Trump becomes president! I hope they don’t add Kyle just for that. I hated his character already. I hope he’s not a damn diversity hire and I’m mixed race myself. If they are looking into an older Hal, then i think it would be better get Guy Gardner instead of Kyle Rayner. But i also think they should not get an actor passed the 35 years old mark, to play him. Hal being older than Batfleck isn’t something i would like. YES. Kyle has no character. Guy has tons of character, is a hard a$$ and would be extremely fun to see on screen as a comedy foil to the relatively serious Hal and John, especially John. I don’t care what Green Lantern characters are in this film, just as long as Simon Baz isn’t one of them. While I can appreciate why he was created, he’s been a terrible character since his creation. To see how to create a wonderful superhero that happens to be an ethnic minority, please see Miles Morales. Kyle is the best Lantern I am elated that he is going to be the 3rd Member of the Corps. from Earth. Screw Guy Gardner. “my room mate Lori Is getting paid on the internet 98$/hr”…..!ce360ctwo days ago grey MacLaren P1 I bought after earning 18,512 DoIIars..it was my previous month’s payout..just a little over.17k DoIIars Last month..3-5 hours job a day…with weekly payouts..it’s realy the simplest. job I have ever Do.. I Joined This 7 months. ago. and now making over. hourly 87 DoIIars…Learn. More right Here !ce360n:➽:➽:➽➽➽➽ http://GlobalSuperJobsReportsEmploymentsEyeGetPayHourly$98…. .❖❖:❦❦:❖❖:❦❦:❖❖:❦❦:❖❖:❦❦:❖❖:❦❦:❖❖:❦❦:❖❖:❦❦:❖❖:❦❦:❖❖:❦❦:❖❖:❦❦:❖❖:❦❦::::::!ce360n….,..